Some of Easter Island’s moai statues are adorned with large red hats, the heaviest of which weigh as much as 13 tonnes. Archaeologists have struggled to understand how these hats were positioned atop the iconic heads, but a new explanation may finally hold the answer—and it’s surprisingly simple. Located more than 2,000 miles (3,200 km) from Chile’s west coast, Easter Island is one of the world’s most remote inhabited islands. It’s just 15 miles long (24 km) and 7.6 miles wide (12.2 km), but the island was home to a thriving Polynesian population starting around the 13th century AD. Also known as Rapa Nui, Easter Island is famous for its moai—humanoid statues measuring 33 feet tall (10 metres) and weighing upwards of 81 tonnes. These statues were made from volcanic rock sourced from a nearby quarry. To position them in place, the ancient Polynesians rocked the large figures back and forth in a walking motion, similar to how we might move a heavy refrigerator today. 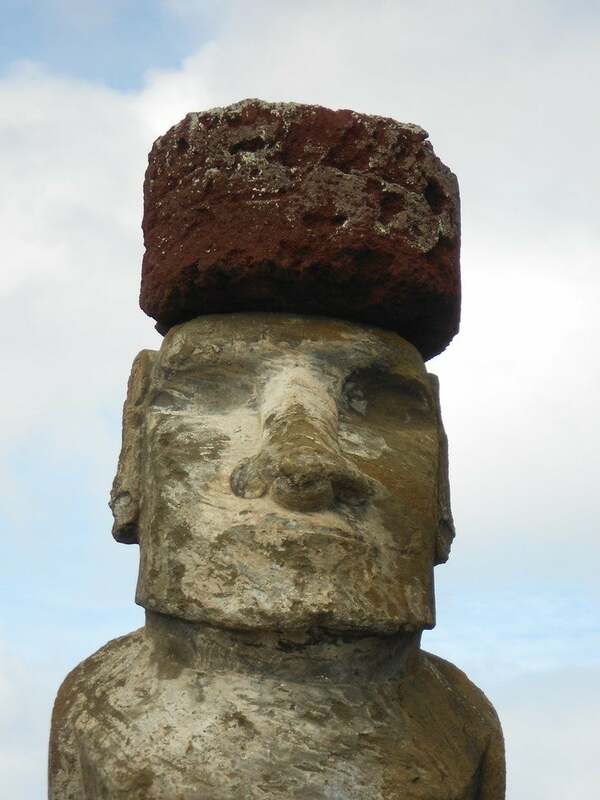 Some of these statues were fitted with large hats, called pukao, made from red scoria, a material that was sourced from a different quarry located about 7.5 miles away. These rocks were likely carved into a cylindrical shape at the quarry, and then rolled to the statue site for further processing. But how did the Polynesian builders place these 12-tonne hats on the 33-foot-tall statues? New research published this week in the Journal of Archaeological Science suggests ropes were used to roll the hats up a ramp, and where they were then positioned into place (see diagram below). But unlike previous attempts to answer this riddle, the authors of the new study used actual archaeological evidence from the island to make their case. Previously, some archaeologists argued that the pukao were attached to the heads before they were lifted upright into place. But remnants of broken and abandoned statues found on the island suggest this wasn’t the case, and that the hats were attached to the tops of standing statues. The researchers say the Polynesians accomplished this using ropes made from plant fibres, a long ramp, and a technique known as parbuckling. Parbuckling is a relatively straightforward method that’s often used to right a ship that has capsized (fun fact: parbuckling was used to salvage the Costa Concordia cruise ship). The parbuckle was also used in pre-industrial Europe for transporting barrels up and down inclines. 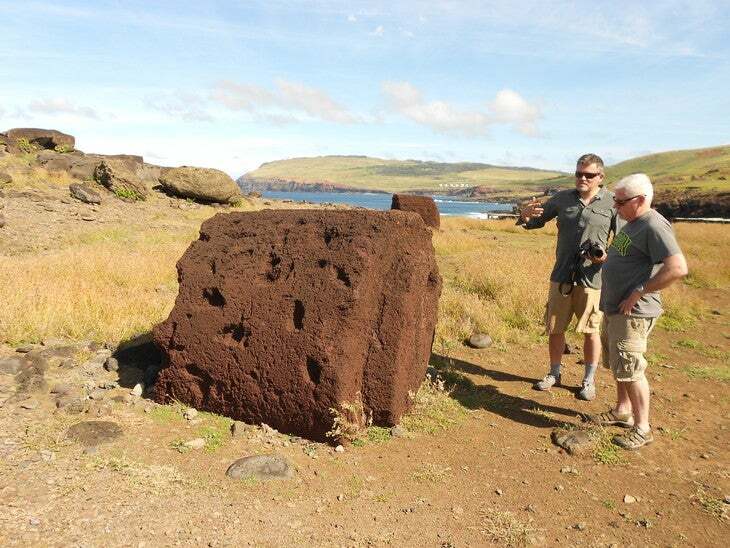 In the case of Easter Island, a rope was wrapped around the cylinder-shaped pukao, and workers pulled the rope, gradually rolling the object to the top of the ramp (a good demonstration with a large log can be seen here). Remarkably, the researchers calculated that only 10 to 15 workers would be needed to perform the task. Once at the top of the ramp, the hats were modified further and placed in the right orientation; shards of red scoria found at the base of a statue support this assertion. Importantly, none of the 50 pukao analysed by the researchers exhibited scratches at the base, suggesting they weren’t dragged into place. Rather, the hats were tipped up onto the heads of the statues. The ramps were then disassembled and transformed into the wings of the platform that surrounds the statues to this very day.